Healthcare Real Estate Capital, as exclusive financial advisor to the Granger Group, is pleased to announce the disposition of a 56-bed, 41,113 square foot long-term acute-care hospital in Omaha, Nebraska. The Asset is directly connected to a hospital that is part of the nation’s largest non-profit health system and is long-term master-leased to a nationally recognized, publicly-traded specialty hospital and outpatient rehabilitation operator. Constructed in 2008, the Asset was developed by Granger and offers best-in-class rehabilitation services combined with Class-A medical design and functionality. On behalf of Granger, HRE Capital undertook an effort to select a well-capitalized investor positioned to acquire the Asset under a restrictive timeframe. Leveraging its unmatched relationships in the healthcare real estate markets and significant database of domestic / international investors, HRE Capital approached and garnered significant interest from a number of active and well-capitalized Investors. Due to HRE Capital’s successful track record with healthcare real estate dispositions as well as the quality and strength of the Asset, Granger achieved its various goals related to timing, pricing and overall transaction structure. The Asset was ultimately purchased by a foreign investor, which represents their first acquisition of a healthcare real estate asset. 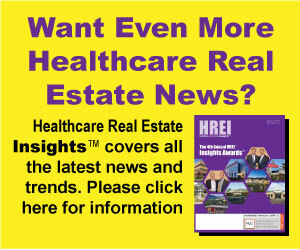 HRE Capital is a national advisory firm focused solely on the healthcare real estate sector. Our clients include many of the nation’s top healthcare providers and developers / investors of healthcare real estate. HRE Capital’s focused model provides clients with an unmatched level of relevant experience and independent transaction analysis, structuring and execution capabilities. Providing both consultative and transaction oriented services, including asset / portfolio joint venture structuring, recapitalizations, dispositions and other related real estate advisory services, HRE Capital has completed engagements approaching $2 billion over the last three years. Founded in 1997, Granger is a capital management and real estate development company that operates in various markets throughout the country. Granger has acquired or developed over 70 properties valued in excess of $1 billion, with a particular focus on healthcare real estate. Granger’s professionals have a wide array of industry experience, with expertise in all facets of real estate finance, operation and asset management. Headquartered in Wyoming, Michigan, Granger is the pioneer of the “health village” concept, which is a fully integrated, world-class healthcare delivery model.